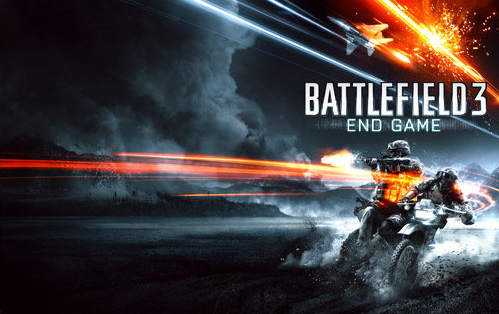 Posted on March 18, 2013	by Derek "Gamer Crash"
As they say, all good things must come to an end and Battlefield 3 is no exception as ‘End Game’ brings the fifth and final DLC pack to the popular shooter. With that comes additional gamer score to gain and I’ve gathered only the best Intel for you below in gaining those additional achievements/trophies. While End Game is currently only available for Premium Members at the moment, the rest of you will be allowed in quite soon. The flag is waiting to be captured so lets dive on in. Just like the other DLC efforts, this final one doesn’t change the pattern and brings another 5 achievements/trophies for players to collect like for another 120 gamerscore and 2 silver and 3 bronze for you PS3 gamers. Just based on what I’m seeing, this round of achievements don’t seem as difficult as the other four. The one seems to be locked in Conquest game types taking place on any of the four new maps. You team will need to capture and hold the base marked with the aircraft symbol just like you did for the AC-130. This time, a transport plane (C-130) will appear allowing you to select “IFV Para-drop”. Select this option, drop down to the land and get a kill with this vehicle to grab this one. *Possible Glitch* It’s been noted that some people need to exit the vehicle in order for it to pop. So try that and if not, keep getting those kills and it should register. I mean…yeah, this is exactly what it says. You’ll need to play the new game mode in this pack and capture an enemy flag which means bringing the enemy flag to your base and scoring a point for your team. Unlike the Quad Bike in Armored Kill, riding in the passenger seat of the dirtbike gives you pretty much full range of motion. In this case, all you need to do is get a kill from the passenger seat to score this one. Outside of the Dirtbike, End Game comes with a couple of other new vehicles including Jeeps sporting Anti-Air guns on the roof. Quite simply, grab one of these jeeps, lock on to an air vehicle, and let’er rip! All it takes is to down 1 air vehicle and this is yours. The vehicle names to look for are HMMWV Asrad and Vodnik AA. This one sounds much harder than it really is. All you need to do is simply transport someone carrying the flag using an air vehicle. That’s right, they don’t even need to score it for you to earn this. If the previous downloadable content is any indication, DICE loves hiding random and humorous things on these maps. End Game follows suit in this regard so let’s have a look, shall we? Yes, the dinosaur teases continue into End Game. While many fans want a full-blown dinosaur element placed in the game, it looks like we’ll have to settle only for these little easter eggs…for now. The latest can be seen on the map Nebandan Flats during a match of Air Superiority. As you fly around, you’ll constantly pass by what looks to be a large bat type of creature just flying around in the sky. It’s actually a pterodactyl. In another nod to a past game, you can find a futuristic looking drone floating aimlessly which many of you will recognize as a mini UD-6 Talon from Battlefield 2142. It can be seen behind the US base, across the river and behind a hill very close to the edge of the map. Might this be a sign of things to come? Yes, the Teddys have returned once more. This time, you can find them easily enough playing Conquest on the map Kiasar Railroad. There’s a number of crane’s placed around the map and if you head to one and look into the driver’s seat, you’ll see a little Teddy bear with a heart on it’s chest hanging out. Another fun little easter egg, a company of snowmen are hanging out in a remote shack off of one of the main roads. Easiest way to find them is to spawn at the US base and take the main road towards the pumping station. to the left you’ll eventually see a little wooden shack. That’s where you’ll find the three snowmen soldiers “chilling” out. Found any more? Let me know in the comments! This entry was posted in Tactical Assist and tagged PC, PS3, Tactical Assist, Xbox. Bookmark the permalink.